Oops! battery. In our everyday life, draining out battery is one of the treacherous acts to better workmanship. Be it a Cell Phone, a Portable Media Player (PMP), a Laptop or any handheld device unless it is solar powered; all of these run in most of the case, if not always, via battery power. And there is nothing called a long battery life. The trick is to get the most out of the power that’s available. Here are few but effective ways to improve battery life or to elongate the operating hours for Notebooks. Based on number of cells ie 6-cell, 8-cell or 12-cell, battery life can be determined but the work load on your device consume the power in no another way. Most of the tips and tricks might apply to traveling or on-the-go. Disable Bluetooth and Wi-Fi: Strongly recommended that you turn off your notebook’s one of the most power consuming devices wireless radios, Graphics usages being the first on the power consumption rank. Minimize the screen brightness: As lower brightness as your eye can handle, it’s too easy and inside your locomotive you’ll feel a small difference on the screen brightness after the change. In most of the notebooks available in markets, function key f8 increased the brightness whereas function key f7 lowers it. Try once now. Multimedia Junkies on the web: Okay, you have a DVD or perhaps a bluray disc from which information is to be sought or watched, even movies perhaps. Assuming you can do this from the internet or your online server, do that rather than employing DVDs. DVDs consume a lot of power. Turning on Wi-Fi for short period is better to grasp your online docs than use the DVD. Alternating, you can copy all the necessary files to your hard disk then go on your work, guess this is the best and effective way. Plug it on: Don’t think that plugging an AC supply will lower you battery life, instead whenever you have the power supply connect that to your notebook battery. This ensures of a dual mode: battery charging plus notebook running thru direct supply. Away from your notebook: Are you going for a vacation or a distant relatives leaving your digital appliances including notebooks at home? Don’t forget to turn off your notebook and pull the battery out. If your notebook run on straight AC power without battery (in most of the cases, it is yes), do that and while on the road you can use the already charged battery. Opt for apt Power Plan: Click the battery icon at the lower right of your laptop and see three default power plans namely; High Performance, Recommended and Power Saver. Most of the time for general use Power Saver is okay whereas all other time Recommend power plan is sufficient. Decide to select one, you will experience huge power savings. Avoid Game Playing: Graphically intensive game uses all PC resources in general, which in turn has a large impact on the battery life. Check if programs are running in background: Identify and remove programs that may be using your battery power and also impacting your overall performance. Ensure you know which is NOT required program to start up and run in background. Be cautious, this could ruin your system. Use Tune Up Utilities StartUp Manager. Power saver mode in Windows Vista & Windows 7: In stead of leaving your notebook on for hours doing nothing, leave it to sleep. Hybrid sleeps available in desktop computers. For every time general use, if you have to save power at the fullest, hibernate your laptop, no no… don’t sleep it or turn it off. Sleeping will obviously engage fans on; and turning off and turning on again will require more power than do that for hibernating. This is my too personal experience and I do it always unless restart is required after few more days. Shorten the length of time before Windows turns off the display: When you’re not using the mobile PC—even for brief periods of time—you can save power by having Windows turn off the display after a brief period of inactivity. You can choose when Windows turns off the display, options available at Power Options. Eject removable devices if not used: Mainly external devices connected via eSATA, USB, Expansion Port or even Express Card port drive power when they are connected. If not used, do remove them including your wireless or USB optical mouse and start using tablet pen or touch pad. Check the battery status from your manufacturer program: It’s always better to check the battery status from the bundled program of your notebook manufacturer. Inquire to your notebook makers if you don’t have one. The battery status may be Good, Weak, Replace, Calibrate , or Unknown. In fact this is the most vital point of all to consider for getting more info about your laptop. 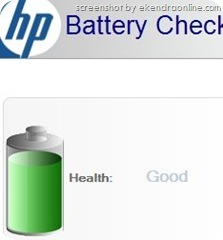 Do not charge the battery for more than 8 hours: recommended by most of the notebook manufacturers including HP, check the Safety & Comfort Guide. Purchase a second battery to limit the number of re-charges on one battery: This is what I have been practicing for years by now. Purchasing second or travel battery (cost around 100$ for 8-cell battery) from your notebook manufacturer is the best practice. Never let battery a chance to discharge, since once it starts discharging- it loses its capacity to hold a charge, and soon will be the time for your to purchase another laptop battery. Remember that there are no any third party hardware devices or software/programs that claim to save power, at least I have not come across.Please, write to us if you have any query or improvement over any point or whole of the article. Forward the link to this article to your friends, they will surely benefit from it. End of tech article HOW TO IMPROVE/ELONGATE LAPTOP BATTERY LIFE.